An ex-freedom fighter is elected president of Timor-Leste as it readies to mark a decade of independence. 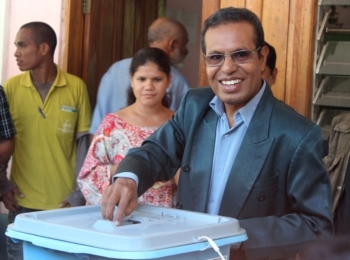 Former freedom fighter Jose Maria de Vasconcelos is the new president of Timor-Leste after winning a peaceful run-off election against Francisco Guterres “Lu Olo” of the opposition Fretilin party. His victory appears promising for stability within the often strife-torn country. Initial results show that Vasconcelos – also known as Taur Matan Ruak – has won more than 60 percent of the vote for the position, which is largely ceremonial but not without influence in a country plagued by poverty and animosities stemming back to East Timor’s fight for independence from Indonesia. Ruak is expected to unify opposing factions and in his own words restore some lost dignity among the veterans, widows and their families whose anger at being sidelined by previous governments had led to an astonishing level of violence and bloodshed given Timor-Leste’s short history. Ruak, 55, also replaces the high-profile Nobel Laureate Jose Ramos-Horta, who was dumped as president in the initial vote a month ago following a fall out with Prime Minister Xanana Gusmao and his National Congress for the Reconstruction of East Timor party (CNRT). The CNRT switched allegiances to Ruak shortly before the poll after Ramos-Horta made noisy allegations of corruption and nepotism within the CNRT’s ranks. This led to a fall out with his old friend Gusmao. If no candidate wins more than the mandatory 50 percent of the initial presidential ballot then a run-off is held within a month. This was widely expected as 12 candidates were competing in the poll. "He can become a president who will unify all political forces,” Ruak’s spokesman, Fidelis Magalhaes, said. Ruak’s moniker means two sharp eyes and he was the last commander of the country’s National Liberation Army before independence. As a former Portuguese colony, Timor-Leste was invaded by Indonesia in 1975 and annexed. He could also prove an important ally for Gusmao. As president, Ramos-Horta was instrumental in getting Gusmao into power following the 2007 polls. In Timor-Leste, executive power belongs to the government of the prime minister who wins an outright majority in parliament. However, if an outright mandate isn’t obtained then the president can decide which party has the right to form a coalition. This constitutional ruling allowed Ramos-Horta to block Fretilin from forming government at the last election. Subsequently, Gusmao and his CTRN were granted an opportunity to form a coalition. Whether Ruak will be required to follow the Nobel Laureate’s lead remains to be seen. Next month, Timor-Leste will mark a decade of independence. General elections are scheduled for July7 and if those elections are deemed free and fair and without violence, then U.N. peacekeepers are expected to end an 11-year presence and withdraw before the end of the year. And Timor-Leste will finally be left to stand on its own.